Prepare for more cosmic adventures with Norrin Radd and Toomie. 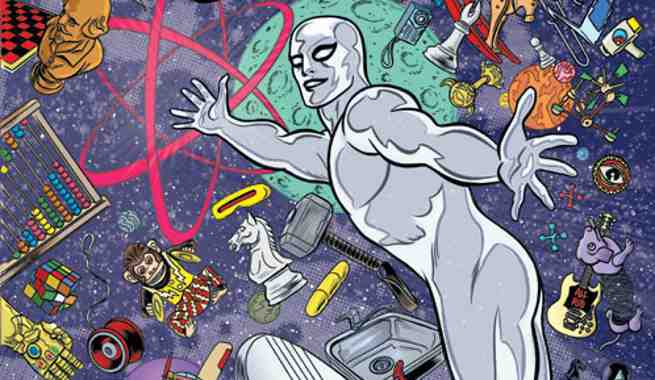 Marvel Comics has revealed that Dan Slott and Mike Allred’s Silver Surfer will continue – with a shiny new #1 issue – in the All-New, All-Different Marvel era in 2016. Slott’s love of the long running sci-fi TV series Doctor Who has been evident in his Silver Surfer series so far, pairing the lonely cosmic wanderer with Dawn Greenwood, a young Earthling who is stronger and more adventurous than she knows. And if Silver Surfer is to be Marvel’s Doctor, then Allred’s imaginative and whimsical art is the perfect match. Keep an eye out for Silver Surfer #1 in early 2016, and take a look at Allred’s full cover for the issue, included below. 'Game of Thrones': Who Is Jenny?